The finest protection against any sort of security threat is to have a complete up-to-date backup of your site. 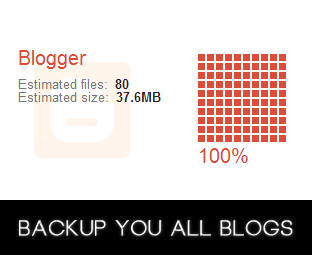 Taking backups on a daily basis is the only habit that a Blogger/Webmaster must have. If your site is massive in size then you can take backups may be weekly or biweekly, but if your site is relatively small then taking the data of your site on a daily basis would not harm you. This does not mean that Blogger is unsafe. All we are suggesting is that, your blog is hosted at Google servers, so you are not the only administrator of your site. If somehow, Google deleted your site probably due to their terms and policy violation then, what would you do? You would be left empty handed. However, if you have a complete up-to-date back up of your site then, things might be turn around. Since, Blogger.com is a free to use service by Google. Therefore, people often create too many blogs under the same account. This makes hell lot difficult for you to manually take backups of each and every site separately. Doing the same thing again and again might annoy us all. 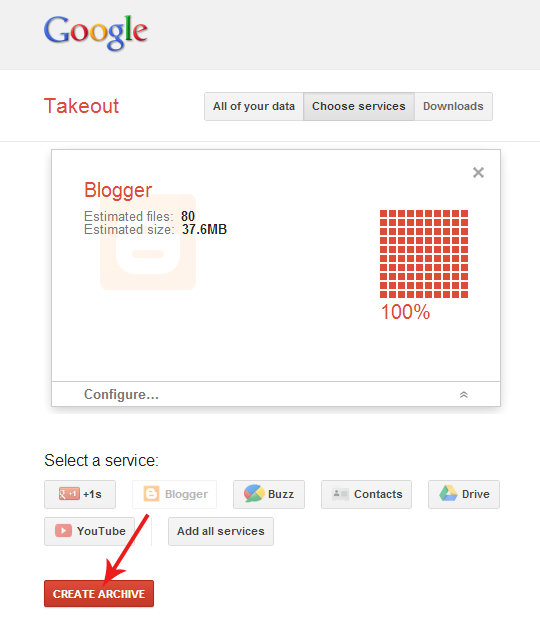 Fortunately, every problem has its solution and thanks to Google Takeout that helps us to download the backup of all blogs under a certain Blogger account. In this article, we will show you How to Backup Data of Your All Blogger Blog with just one Click. From the list select of services select “Blogger” and it will take you to a new page which would derive the data of your site from your account and would also calculate its total size. Once its finishes the calculation, Select the “Create Archive” button at the bottom of the page and proceed to the next step. (Remember: you can also back up a single site by using the configuration tab). Now, a new wizard would take place, it will again calculate the date of your all blogs and would generate a Database for you so you can download it with just once click. Usually it takes few seconds to complete but if the size and the numbers of your blogs are more massive than it would take a while to generate. Once the progress bar reaches 100 you can press the Download button to download the whole database of your all blogs. (The finest thing about this service is that it compresses the data tremendously that a 1GB file reduces to just 300MB). After downloading the database successfully, you can unpack the files which would reveal the backups of your all blogs arranged in an alphabetical order. Seems like, mission accomplished! 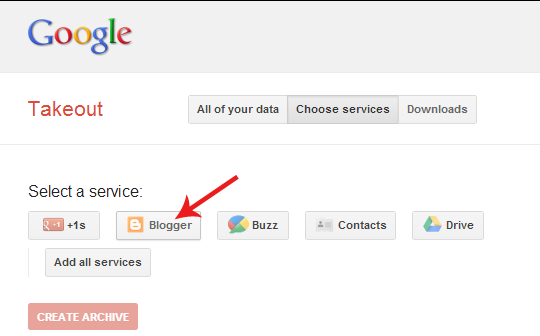 Now you can back up your all blogger sites within few clicks. On the top of that, the database is highly compressed, so it would take much lesser time to download. If you liked this article, then do share it on Facebook, Twitter and etc. Very nice tutorial. It also very helpful. I just know about the Google Takeout. hmm very usefull tips to beginner as well as for pro bloggers also, Thanks for sharing this with us ! Thanks for sharing this detail because it would be help a lot for unwanted warnings and bloggers can work without any hesitation. Well, thanks dude. Dude, can you help me to make a scroll bar like yours. I mean I read your webkit scroll bar post but it didn't worked for wordpress! This is real a nice tutorial. but how to restore .atom file? it will only content with post or with templates and widget? You can upload the .Atom file with the same way you upload the XML Backup. It mainly consists of Posts and Comments, no it would not backup your widgets or template for that you have to download the template manually. Thanks for good content, did as you described, however couldn't open the downloaded files, do you know witch application it should be opened with? Try using in Google Chrome! Awesome--thanks. Just did it and feel much better.